It is an impeccable convergence networking solution of Data and Video. High Speed Fiber Internet makes working and playing less demanding than any time in recent memory with more reliable high speeds. The fiber lines go straight to your home, so you're perusing is as quick as would be prudent. Start up various gadgets on the double without losing speed. Offer your month to month benefit over different PCs at no additional charge (requires a switch). Access your webmail when voyaging and perusing from other Internet Service Providers. You can download all the more, speedier, with fiber. Fiber Internet is more dependable than Wifi. 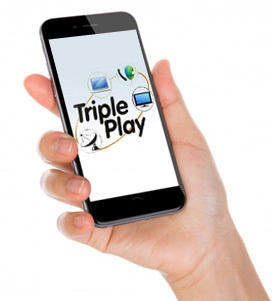 Triple Play is India's fastest growing Broadband Internet Service Provider offering unlimited plans from 5 Mbps to 100 Mbps at very affordable prices. We are available at selective pincodes in New Delhi, Gurgaon, Jodhpur, Kanpur and Jhansi.